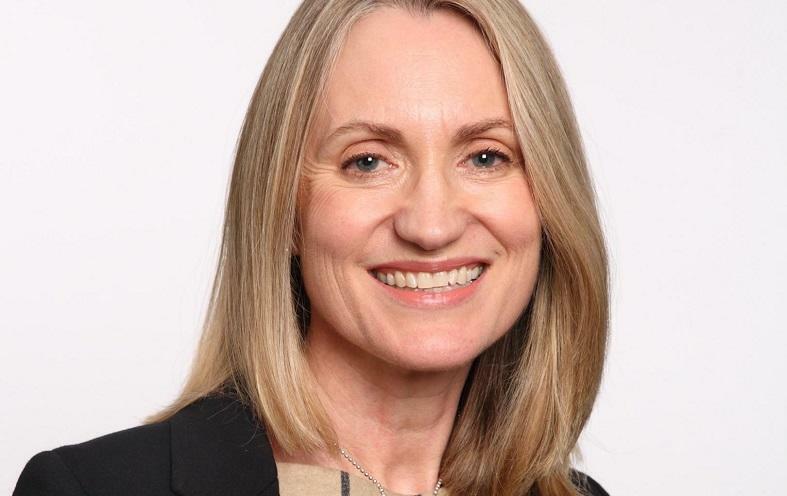 Most of you will know or have heard of Jane Ashton, Director of Sustainable Development at TUI Group, in charge of sustainability management and strategy of the world’s largest integrated travel company. During ITB Berlin earlier this year we had the chance to meet Jane and to learn first-hand about TUI Group’s new sustainability strategy. In this interview, Jane tells us where the sustainable development journey is going in tourism, where she sees the main challenges and why – despite sustainability challenges of a growing tourism sector – there is reason to be optimistic. Which books aspiring sustainable tourism leaders should not miss. Jane, do you remember the first time you heard – or thought – about sustainability linked to tourism? My interest in environmental issues dates back to my student years, particularly the time I spent at uni in Germany in the 1980’s, where the damage of acid rain on the surrounding forests was all too evident. In the late 1980’s and 1990’s, there was a lot of focus on niche ecotourism, yet as a tour operator product manager, traveling frequently, it was clear to me that the real sustainability challenge (and opportunity) was for the mainstream travel industry, which has more to lose than most sectors when destination communities and environments cease to thrive. I was involved in 2000 in the Sustainable Tourism Initiative, led by the UK Government, and also around that same time learned a lot from my German, Dutch and Nordic industry peers at the UN-backed Tour Operators Initiative for Sustainable Tourism: they had been seeking to tackle the sustainability impacts of their respective businesses long before this was seen as a business issue by most UK travel companies. 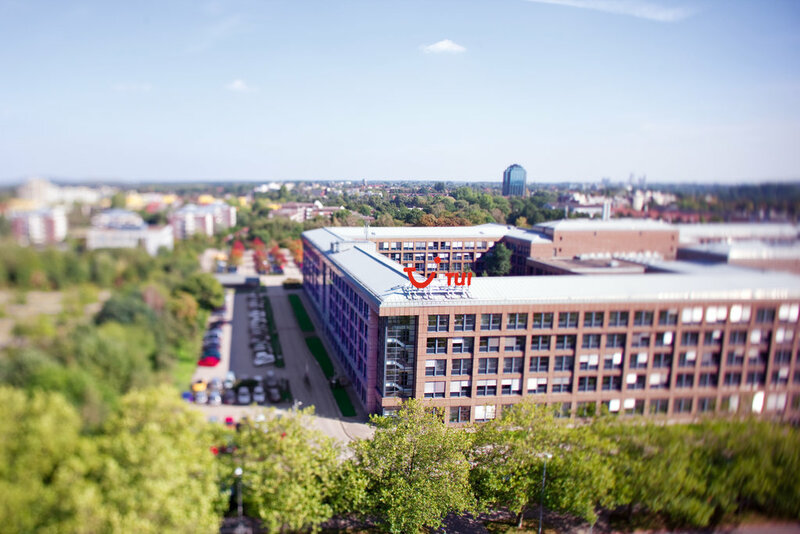 Indeed, TUI established its environmental department 25 years ago this year! Something increasingly evident is the complexity of driving significant sustainability change, particularly in destinations. There are so many players involved, sometimes with conflicting priorities, no one government department responsible for managing the sustainability of a destination, no one owner of the tourism ‘product’, a lack of accessible sustainability data, etc. The enormous, inter-related challenges of sustainable development are too big for any one organisation to solve – even one as large as TUI. So seeking out effective collaborations is key. We have recently set up the Group-wide TUI Care Foundation, to be a channel for collaborative sustainability initiatives with destination stakeholders in the years to come. As sustainability director at TUI Group, where do you see the priorities in terms of sustainability this year? TUI Group’s sustainability priorities are outlined in the ‘Better Holidays, Better World’ sustainability strategy we launched last year. It has three main pillars: firstly, we are working to reduce the carbon intensity of our airlines, cruise and ground operations. Secondly, we want to significantly increase the number of ‘greener and fairer’ holidays we operate. Thirdly, we set up the TUI Care Foundation through which to channel our efforts to enhance the wider positive impacts of tourism – particularly in the areas of sustainable innovation, investment in tourism skills to boost local employment opportunity, and supporting the sustainable management of tourism destinations. Do you share the view that “sustainability think” is becoming mainstream in travel and tourism? The ‘sustainable business’ landscape has changed dramatically in the past 15 years. Today’s consumer expects reputable brands in any sector to be vetting their supply chains to ensure that goods and services are not produced at the expense of the well-being of people or the environment. Media, investors and employees have similar expectations, and legislation is starting to back this up. When TUI started publishing carbon emissions data over a decade ago, it was an unusual step: now nearly every FTSE100 company is doing so and it will soon be a legislative requirement across the EU. As integrated tourism business operating in around 180 countries worldwide, how does the TUI Group approach sustainability? The ultimate prize is to integrate sustainability into business as usual. It is now integral to the new TUI Group Vision, and part of product, purchasing and operational strategy: hotel suppliers are contractually obliged to work towards achievement of a GSTC-recognised sustainability certification. Our TUI Collection excursion programmes focus particularly on supporting the local economy; our airlines are the most carbon efficient in Europe and have targeted further CO2 improvement. We have Sustainability Coordinators in each major source market, who in turn work with a network of champions across their business to embed sustainability into communications, culture and performance. The Better Holidays, Better World strategy highlights the 3 pillars and 9 areas of focus where we aim to make change, each underpinned by KPIs [Key Performance Indicators] – in other words, we manage this much as other business goals. Sustainability being such a diverse topic, how do you prioritize? Good question! Well, stakeholder input – internally and externally – and desk research have always been key elements informing our strategic priorities. 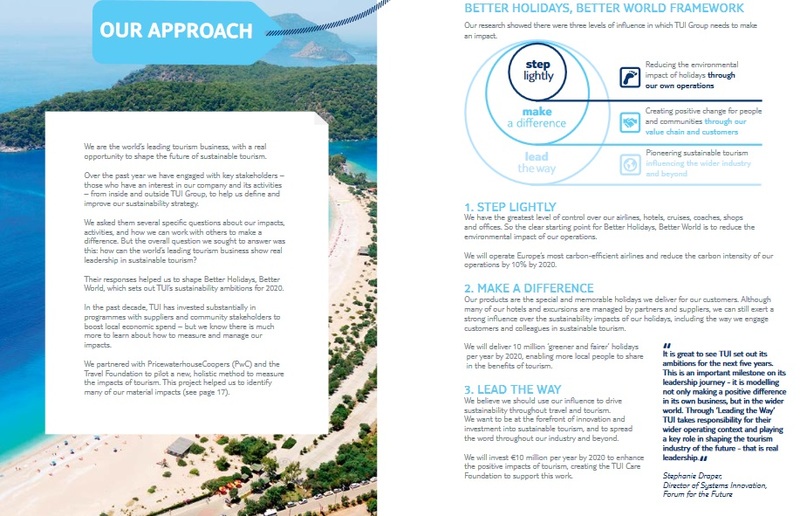 However, in the 18 months preceding the launch of ‘Better Holidays, Better World’, we also worked with PwC and a wide range of stakeholders in Cyprus on a major project, commissioned by The Travel Foundation, measuring the total impact (environmental, social, economic and tax) of TUI’s business on a destination. The insights help us inform sustainability priorities – in some instances, they reinforced what we knew, in other areas preconceptions were blown away. Interestingly, the indirect and induced economic impacts of our operations were even greater than the direct impacts. The employment we stimulate is by far the area of highest positive outcome – we will now increase our focus on supporting local people in destinations develop the skills to work and progress in the tourism value chain. Some main challenges are the big picture issues outside of our zone of control – such as the management of destinations for sustainability (UNEP research shows only 1/3 destinations confirmed they had even factored sustainability considerations into their tourism planning) or the dearth of market incentives to stimulate the scaling up of production and distribution of sustainable aviation fuels. But the back end of 2016 gave cause for celebration, with the September launch of the UN Sustainable Development Goals 2015-2030 and December’s Paris agreement on Climate Change – two frameworks against which the actions of all major players in society – public and private – will be measured in years to come. Both GSTC CEO Randy Durband and Salli Felton of the Travel Foundation mentioned in their interviews that effective destination management is essential to take sustainability in tourism to the next level. How does TUI support responsible tourism in destinations? We support and participate in numerous multi-stakeholder projects in destinations. Key partnerships include various initiatives over the years between TUI and GIZ (German organisation for international collaboration), with local government involvement, focusing on the creation of training schools where local people gain practical experience and formal qualifications working in the tourism supply chain. Also our partnership with The Travel Foundation, with whom we have worked on a wide suite of projects – typically a destination sustainability council is established with local stakeholders, who are then key to identifying the priority sustainability issues to address, and then being part of the solution. In our recent interview with Xavier Font, he suggests that sustainability communication to be effective should emphasize positive aspects like health and quality, rather than trying to cater to the “eco police”. Do you agree? Absolutely! We are working with Xavier right now on testing sustainability messaging with customers to learn how to make it as engaging and appealing as possible. With our ‘Better Holidays, Better World’ strategy and its three core pillars of activity – Step Lightly, Make a Difference, Lead the Way – we deliberately sought out simple, positive, inclusive language. We know our customers care about sustainability, but not enough for it to be a basis for their holiday decision, so it’s up to us to find the right language to raise awareness and demand for more ‘greener and fairer’ holidays – we’re still working on it! How do you measure the success of sustainability initiatives undertaken at TUI? We track and report on a wide range of performance indicators related to targets and initiatives – check out our annual sustainability reports. Some of the most impactful measures are those which track the correlation between sustainability-certified hotels and higher customer satisfaction – and we find that same correlation with the TUI Collection excursions, which have a focus on sustainability. Other measurements of particular business significance are the many €10Ms saved through eco-efficiencies and seeking to grow the percentage of colleagues who rate TUI as an environmentally responsible business. And finally of course the ongoing measurement challenge with destination projects – how to track long-term outcomes and impacts as opposed to just actions and outputs…. 3 books on sustainability or leadership which every tourism professional should read..? 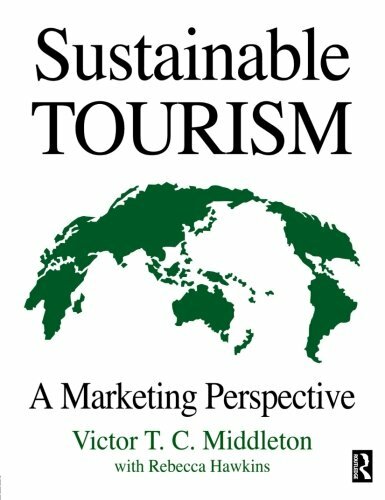 Holidays That Don’t Cost The Earth by John Elkington and Sustainable Tourism: A Marketing Perspective (Middleton & Hawkins), were books which struck a cord when I was first researching tourism and sustainability. Over the years I have also read most of Jonathon Porritt’s books, blogs and papers. But generally I keep up by reading latest case studies and reports, and of course e-news, for example Valere Tjolle’s Vision on Sustainable Tourism and Professor Harold Goodwin’s Responsible Tourism News. Non-travel specific sustainable business feeds which I follow include those from Business & Human Rights; Climate Action; Corporate Citizenship; Business in the Community; Guardian Sustainable Business and Forum for the Future. Which achievements as TUI Sustainable Development Director are you most proud of so far? TUI now views and seeks to manage sustainability as a serious business challenge and opportunity, so I’m proud I’ve played a role in that change, but must stress that so have many other enlightened senior managers at TUI along the years! We are well aware that sustainability is a journey – there is far to go. But if I have to highlight one particular achievement, it would be Project Discovery, now in its 10th year at TUI UK. Every year 10 colleagues – from all areas and levels of the business – are selected from numerous applications to spend two weeks working on one of the Travel Foundation destination projects, their skills having been carefully matched to the needs to the project. This year will see our 100th volunteer, and their personal feedback is always so positive and energizing. Project Discovery brings sustainable tourism to life and stimulates an engagement for doing business differently across many areas of the organisation, and that becomes viral – and I guess that’s the ultimate aim of the sustainability professional! Learn more about TUI and Sustainability or connect with Jane Ashton on LinkedIn. Enjoyed our interview with Jane Ashton on sustainable travel and sustainability strategies at TUI Group? Spread the word!